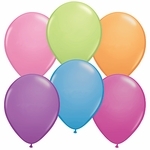 Unique and eye catching latex balloons are perfect for any party or get-together! Our 11'' Regal Purple Latex Balloons is an inexpensive addition to any gift, floral arrangement or event decor! Make an impact by coordinating this balloon with our large selection of foil balloons to create an exciting balloon bouquet! We urge all customers to attach a properly sized balloon weight and ribbon to each balloon purchased.